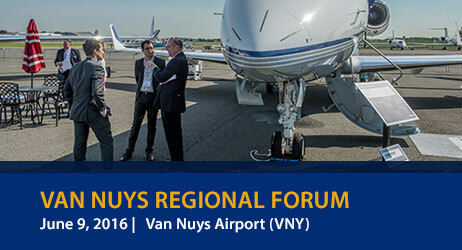 The business aviation community comes together on June 9, 2016 for the next NBAA Regional Forum at (VNY) Van Nuys Airport, and booking a private jet through Los Angeles Private Jets is the best way to get there. Current and prospective business aircraft owners, operators, manufacturers, customers and other industry personnel will have the opportunity to network with other aviation professionals and learn more about the needs of local aviation communities. The NBAA Regional Forum at Van Nuys will feature a variety of static displays where you’ll be able to check out and board the newest, state-of-the-art business aircraft. You’ll also have the chance to speak with aviation professionals who can answers all your questions regarding the benefits of private aircraft ownership, as well as membership with the NBAA. There will also be exhibitors of all kinds on-site, presenting products and services directly to business aircraft owners, operators, and other customers. Los Angeles Private Jets can arrange your private flight to land right in the middle of the action at the busiest general aviation airport in the world, (KVNY, VNY) Van Nuys Airport. Need a hotel while you’re in town for the forum? Check out our Van Nuys Jet Charter page, with a list of the top five-star accommodations in the area. Request a Quote or give us a call at 1-888-987-5387 to speak with one of our Los Angeles Private Jet Charter representatives to book your private flight to the 2016 NBAA Regional Forum at (VNY) Van Nuys Airport!